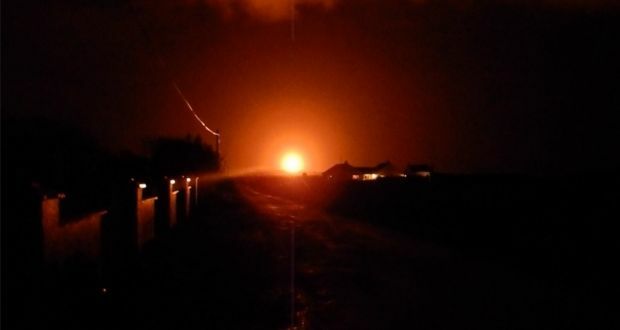 Shell Ireland has been fined €1,000 and ordered to pay €15,000 in legal costs for causing light and noise pollution from a gas flare during start-up testing at the Corrib gas terminal in Co Mayo. The prosecution was brought by the Environmental Protection Agency (EPA) following complaints from people living around the Bellanaboy Bridge area, the location of Shell’s terminal to bring in gas from the Corrib gas field 65km offshore. Shell E&P Ireland Ltd, which operates the controversial gas project, pleaded guilty at Dublin District Court on Monday to breaching two counts of the EPA Protection Act during “flaring” tests on New Year’s Eve night. The company admitted that emissions from the gas flaring activity during the night resulted in impairment of, or interference with amenities of the environment beyond the installation boundary when people might reasonably be expected to be sleeping. The second charge stated it resulted in noise emissions that exceeded the applicable limits for evening time at noise-sensitive locations. Outlining the background, prosecution solicitor Alan Doyle told Judge John O’Neill that during the start-up tests, Shell needed to flare off the mixture of gas and sea water until it had pure gas, which could then be refined. EPA inspector Kealan Reynolds told the judge it was agreed that a certain amount of flaring would have to happen for 15-30 minutes in daytime. Consent was given on December 29th last to open the valve on to the Corrib field, he said. He said the EPA received complaints from locals regarding noise and light from the flaring from 8pm on New Year’s Eve until about 4am on January 1st. Mr Reynolds said the EPA carried out an investigation and visited the terminal unannounced on January 4th, when they gathered data from personnel and the monitoring equipment on site. The information they obtained confirmed the noise limit had been breached, he said. Mr Reynolds agreed with defence counsel Declan McGrath that Shell co-operated and that their managing director had sent letters to local residents to apologise. Mr Reynolds agreed that the letter explained there were “unexpected difficulties” that led to flaring for longer and later in the day. The court heard that the maximum District Court fine for each offence was €4,000, and that Shell had agreed to pay the EPA’s €15,138 costs. Mr McGrath acknowledged to the judge that the flaring should have happened for a shorter period and during the daytime. He said there had been technical difficulties during the start-up procedures. Counsel asked the court to note that the flare went on for minutes rather than hours and the disturbances were regretted by Shell. No damage was caused to the environment and the incident was on the lower end of the scale, with no residual impact requiring remedial measures, Mr McGrath said. The court heard the company had no prior criminal convictions. Judge O’Neill noted that there was no danger to life inside or outside the facility and said he took into consideration Shell’s early guilty plea as well as their apology. He said the company met the charges in a responsible manner. However, he said he understood why local people might be concerned, having regard to the history of the location. To read the Irish Times Article, please click here.